Just another way the state is trying to stop reform. We must get out the vote and get these SQ passed. Why are our state leaders so happy to keep us #1 in incarceration and last in education ? They are having Town Hall meetings & Community Conversation meetings around the state. Check it out find your date & location and take a couple of friends with you. I messed up and need your help. Need your help, somehow or other on my cellphone I managed to delete all the emails in the OK-CURE inbox. I did manage to recover some unread emails in the trash on the pc but I know I lost several hundred emails so if you have sent me some and I hadn’t replied please forgive me and resend again. Have you read about all the cellphones and other stuff getting into the prisons? This is what DOC is doing to stop it. The Oklahoma Board of Corrections voted unanimously on Thursday to appoint the state corrections system’s interim director to permanently lead the agency, effective immediately. Many people on Facebook thought that class action should be done here also. Oklahoma’s Department of Corrections begins moving inmates Tuesday to a newly leased private facility in far western Oklahoma, where state employees will run the prison. The agreement between the state and Corrections Corporation of America is a first in Oklahoma’s prison system. Two state questions that could have a positive impact on Oklahoma’s prison population moved closer to being on the November ballot. They are going to try and have 1 hour of visiting per inmate on Sunday & Monday. A storm blew through the area and has caused power outages and transformers to blow. They are working on it now. The Tulsa area Genesis One Potluck will be held on Saturday, July 11th. Just got a call from the Warden at DCCC from OKC. We would like to see if we could get a class action started in Okla like they did in TX. We need this info asap. With the heat index in Texas already approaching 110 degrees Fahrenheit, a federal judge certified a class action for over 1,400 inmates who want the state to install air conditioning to prevent prisoner heat-stroke deaths. The Oklahoma Legislature took some important steps on criminal justice reform in the 2016 session. This progress is the result of a collaborative effort by dozens of stakeholders to reduce penalties on low-level crimes and make alternative sentencing more accessible. Unfortunately, lawmakers’ longer track record of ratcheting up sentencing and expanding the criminal code was also on display this session. Tulsa area Genesis One Potluck will be on Saturday, May7th at Bethany Christian Church, 6730 S. Sheridan Rd. Dinner is at 6:45 p.m. Bring a covered dish. Bring a family member or G1 Grad and hear inspiring testimonies from our G1 Grads and current members. We hope to see you there! For more information, call 918-665-3524. The number of prisoners who died last year while in the custody of the Oklahoma Corrections Department grew by roughly 70 percent compared with figures for 2010, a trend officials say is likely to continue as inmates grow older behind bars and prison ranks continue to swell past record levels. In 2010, the Corrections Department reported 63 inmates died while in the agency's custody. Last year, 108 prisoners died while serving time, an increase of 71 percent. During the same time period, the overall prison population grew by only 8 percent, records show. And while prison life has a reputation of violence, records provided to The Oklahoman through an open records request suggests state inmates are passing away in much the same ways as their counterparts on the outside. Records show that 397 prisoners died while in the agency's custody between 2012 and 2015, mostly of heart disease, liver failure, various types of cancer or afflictions of the lungs. Please come and bring all you can with you so we can show how many people are ready for change, how many are demanding change now. It is Monday the 29th. From 9AM till 3PM in the 2nd floor Rotunda. Just steps from the Governor and Lt. Governor’s offices. The speakers are listed below, so fill free to come and go at will and visit with your state Representative and state Senator. Ready for the Rally Feb 29th at the state capital? Monday Feb 29, is our 3rd Rally at the state Capital. Come support the 2nd Chance Initiative and help end Mass Incarceration! We are specifically looking for young women (between the ages of approximately 18-35) who have recently left prison after serving a sentence of one year or more. The state has about 28K inmates in both state and private facilities, and state prisons are at 122 percent of capacity OKLAHOMA CITY — A longtime Republican political operative who previously headed the Federal Emergency Management Agency now has the daunting task of leading Oklahoma's overcrowded and underfunded prison system, which has come under increasing scrutiny after a series of problematic executions. 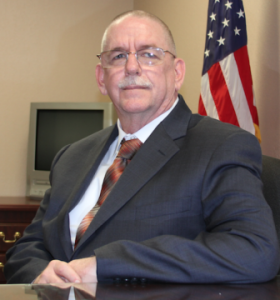 Joe Allbaugh, a 63-year-old native of Blackwell, Oklahoma, appointed interim director of the Department of Corrections last month, said Wednesday that he's made unannounced visits to more than a dozen prisons in the state. He said facilities are crumbling and overcrowded, guards are underpaid and understaffed, employee morale is low and the state is ill-prepared to handle a projected increase of more than 1,000 new inmates over the next year. JOE M. Allbaugh told Gov. Mary Fallin, when she asked him to step in as interim director of the Oklahoma Department of Corrections, that if she wanted a caretaker in the job, look elsewhere. “I like challenges in my life, and I'm a doer,” Allbaugh said this week. Who belongs in prison? Oklahoma has the second-highest incarceration rate in the nation. About half of Oklahoma’s prison population either has had a history of or currently has a mental illness, and many also face addictions. There is a better way—for taxpayers, communities, and offenders—to address nonviolent crimes. Successful reforms in other states show that criminal justice reform can reduce crime and costs at the same time. Join us for a conversation about reforms possible this year that could change the direction of Oklahoma for the better. The Oklahoma Pardon and Parole Board has proposed new rules and regulations for the commutation process. Because this rule impacts the public, there is an administrative process to go through. The good news is that inmates and their families have an opportunity to make suggestions, but time is critical. There are three ways of commenting. Written and/or in-person comments can be provided as follows: Written comments can be mailed to the PPB at P.O. Box 11341, Oklahoma City OK 73136, or Emailed to: boardcommunications@ppb.ok.gov DEADLINE FOR WRITTEN COMMENTS IS NO LATER THAN 5 PM on February 16, 2016. Oral comments can be made at a PUBLIC HEARING ON FEBRUARY, 22, 2016, beginning at 10 AM, at the Kate Barnard Community Corrections Center in the Ted R. Logan Meeting Center, 3300 Martin Luther King Avenue, Oklahoma City. The state of Oklahoma and state law enforcement officials are challenging a recent Federal Communications Commission rule that caps the amount of money prisoners and their families are charged for telephone calls. Oklahoma Department of Corrections’ interim director Joe Allbaugh, Oklahoma County Sheriff John Whetsel and the Oklahoma Sheriffs Association filed a petition on Jan. 25, via Attorney General Scott Pruitt’s office, requesting the U.S. 10th Circuit Court of Appeals invalidate a ratings cap on inmate phone costs passed by the FCC in October. The court unsealed the petition Friday. So far, Oklahoma is the only state to challenge the FCC rule in federal court. Oklahoma voters might get a say in rationally and safely reducing the state prison population if a broad-based coalition successfully gathers 86,000 signatures on an initiative petition. The ballot initiative would seek to reclassify low-level drug possession and some property crimes from felonies to misdemeanors, and require hundreds of nonviolent offenders to receive treatment and supervision in the community rather than serving costly, and largely ineffective, prison sentences. If the measure is successful, voters would accomplish through a ballot initiative what the Legislature never could bring itself to do over the last two decades — reform a criminal justice system that consumes a disproportionate share of state appropriations without leaving communities any safer. This year, our nation will make some important decisions about the direction and leadership we want for our country. Come November, Oklahomans will flock to ballot boxes across our great state to make their voices heard. But just as important as who we choose to lead our nation is how we appropriate hard earned dollars here in Oklahoma – especially when it comes to preventing crime and making our communities safer. Oklahoma has the second-highest overall incarceration rate in the country, and the highest incarceration rate for women. Oklahomans spend nearly $500 million a year to pay for corrections — a cost that has grown by 172 percent over the past two decades. With the prison population, and cost to taxpayers, continuing to climb, it’s time to ask ourselves: Shouldn’t we be getting a better return on our investment? Isn’t there a better way to invest in public safety and address the root causes of crime? The answer is yes, and today we are taking a bold step in the right direction. Reporter wants to talk about how it is getting a driver’s license once you get out. Despite efforts to reduce incarceration, Oklahoma’s prison population continues to grow at a steady pace. The trend includes a surge of state inmates being held in county jails in recent months and the rate of women in prison reaching its highest recorded level. Oklahoma Department of Corrections data show that since late 2014, a year when early-release policies were relaxed to help reduce incarceration, the number of inmates in corrections facilities has increased by nearly 1,200, reaching 28,095 near the end of 2015. The total also rose during 2014. Data released by the U.S. Bureau of Justice Statistics also show that Oklahoma had the second highest incarceration rate in the nation in 2014, at 700 inmates per 100,000 population. The national rate was 471. Oklahoma ranked fourth in 2012 and second in 2013. OKLAHOMA CITY — The governor has approved shortening the prison sentences of two state inmates — the first commutations since 2012. Gov. 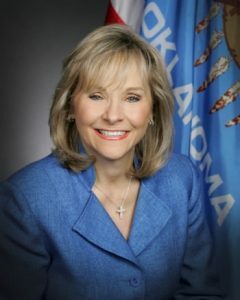 Mary Fallin last week signed off on recommendations made by the state Pardon and Parole Board for two drug offenders serving lengthy sentences: Donnie Daniel, whose life without parole sentence will be commuted to life with the possibility of parole, and William Wood Jr., whose 117-year-sentence will be shortened to time served. Daniel, 53, was sentenced under the state’s three-strikes law that, until 2015, mandated a life without parole sentence for drug trafficking after two drug convictions. In his application for clemency, Daniel told the parole board he is terminally ill and would like some time with his grandchildren before he dies. Daniel was convicted in 1997 and has been in prison 18 years. Wood, 60, is an Army veteran and former preacher imprisoned since 2005 for methamphetamine. He has been in prison for 10 years. Wood still has to serve an 81-year sentence for possession of a controlled dangerous substance plus one year for drug paraphernalia. OKLAHOMA CITY — Criminals are finding it tough to receive paroles in Oklahoma, especially those convicted of having once committed violent crimes. The state Pardon and Parole Board considered more than 4,000 eligible inmates in 2015, recommending only 28 violent offenders for parole, while paroling 363 nonviolent offenders, records show. Of the violent offenders recommended, Gov. Mary Fallin approved only six. Nonviolent paroles don’t require the governor’s signature. A “violent offender” hasn’t necessarily behaved violently, but by definition has been convicted of a violent crime under state statutes. There are more than 50 violent crimes in Oklahoma, ranging from murder and robbery to using a firearm to commit or attempt a felony. Oklahoma Policy Institute is pleased to announce that Ryan Gentzler has joined the organization in a new policy analyst position that will focus on criminal justice issues. The position is funded through a grant from the Center on Budget and Policy Priorities that is intended to support state policy groups in work that can have a significant impact on critical policy issues. "We are very excited to be adding a dedicated staff person to examine Oklahoma's criminal justice policies," said David Blatt, OK Policy's Executive Director. "Many organizations have laid the groundwork for criminal justice reform, and with an increasing number of political and civic leaders getting on board, the time is ripe for significant and urgently-needed progress." With the addition of an analyst focused on criminal justice issues, OK Policy will be able to expand its research on how to reduce incarceration while protecting public safety, expand proven community-based alternatives to jail and prison, and make it easier for Oklahomans with felony records to rebuild their lives after incarceration. The Oklahoman Editorial Board Published: January 3, 2016 ROBERT Patton's tenure as director of the Oklahoma Department of Corrections was marked by controversy. Now his departure is doing the same. Patton's decision to take a job with a private prison company in his home state of Arizona has the attention of an Oklahoma lawmaker who says that at the very least, it violates the spirit of a state conflict-of-interest law. “Enough of those things and people start losing their faith in government,” Rep. Mark McCullough told Oklahoma Watch. Does Corrections Chief’s New Job Violate State Law? Department of Corrections Director Robert Patton’s quitting to take a job with a private prison company that contracts with his agency is raising questions about whether the move violates state law. Patton announced earlier this month that he would step down as Corrections Department director to become deputy warden at a private prison in Kingman, Ariz., which Geo Group took over as operator on Dec. 1. Patton, who worked in the Arizona prison system before being hired as Oklahoma corrections director in early 2014, said he wanted to be closer to his family. His resignation is effective Jan. 31, but he will take accrued leave starting Christmas Day. Under an Oklahoma conflict-of-interest law, any state officer or employee who exercises discretionary or decision-making authority in awarding a state privatization contract cannot be employed by the contracted company for one year after the contract award date. Senator Cal Hobson on KTOK,1000 AM, this Sunday, at 7 p.m. Senator Cal Hobson will be talking about Criminal Justice in Oklahoma. Please invite your friends to listen to his thoughts about a prison system that is overcapacity and a $900,000,000 projected deficit for 2016. Please invite your friends to listen. Thank you for your time. Looming budget cuts and talk of consolidation has led two top staff members at the Office of Juvenile Affairs to resign, officials say. Executive Director Keith Wilson, in an email this week, notified the board chairman he intends to resign effective Dec. 31. Wilson, a retired judge, has served as director since 2012. Wilson is leaving the agency due to “changing circumstances,” said Paula Christiansen, an agency spokeswoman. Chief of Staff Jim Adams also is resigning, she said. Today, the Federal Communications Commission’s order to lower prison phones rates was published in the Federal Registrar triggering a 90-day window for the rules to take effect. As of March 17, 2016 all prisons, jails and detention facilities will need to lower their rates according to the FCC’s rules. The new rates will be capped at 11 cents for state and federal prisons, 14 cents for large jails and 22 cents for smaller jails. For the estimated 2.7 million children with an incarcerated parent, these reforms will finally eliminate the financial barriers that prevent meaningful communication. For those incarcerated on the inside, affordable phone calls will help maintain the bonds with their family and community on the outside necessary for re-entry. Why would anyone want to serve as Oklahoma’s corrections director? The state’s prisons are dangerously overcrowded – at 112 percent of capacity – and woefully underfunded – nearly a third of authorized staff positions are unfilled. Lawmakers tout criminal justice reform, yet do little about it, clinging instead to a politically pleasing lock ‘em up and throw away the key mentality. And when a system set up for failure fails, whose head rolls? The director, of course.This is not a defense of Robert Patton, who resigned recently after less than two tumultuous years that will be remembered best for a series of execution problems. Rather, it is an indictment of the state’s elected leadership that knows it has a serious problem, yet refuses to invest the money and embrace the strategies necessary to create a truer system of correction. It’s late November, and a storage room at a west Edmond office is brimming with packages, addressed and ready to ship to Oklahoma children, just in time for Christmas. There aren’t Thunder jerseys, Elsa dolls, or X-box games among the gifts. What’s inside is far more personal and valuable – a video message from a mother or a father who can’t be present every day. The DVDs are the work of the Oklahoma Messages Project, a four-year-old non-profit whose mission is to help the state’s invisible children – an estimated 30,000 whose mothers or fathers are in prison, literally out of sight and out of touch. The 15-minute videos revolve around Mom or Dad reading their child a book but also include personal messages that can range from reassurances they are safe in prison to bedtime prayers. The resignation of Oklahoma Department of Corrections Director Robert Patton after less than two years on the job shouldn’t come as any big surprise. Patton took a few steps to streamline the huge bureaucracy such as removing DOC-ready inmates from county jails more quickly. But he forever will be remembered as the director who oversaw the troubled execution of Clayton Lockett in 2014. It also was on Patton’s watch that the wrong lethal injection drug was used during an execution in January. That same incorrect drug was delivered to the Oklahoma State Penitentiary for the scheduled Sept. 30 execution of Richard Glossip, prompting Gov. Mary Fallin to put a temporary moratorium on executions. Patton is the second DOC official to leave since a multicounty grand jury began investigating the execution protocol. Penitentiary Warden Anita Trammell recently retired from her post one week after she testified before the grand jury. Oklahoma has 2008 men & women serving Life. We have 879 age 55 or older men & women. Some of which have done 20 or 30 years without a write up. They have earn a 2nd chance. We want to make sure that they get that 2nd chance so coming soon more info on OKLAHOMA’S SECOND-CHANCE INITIATIVE. If you get our Nation Inside email blast good you will get the info soon. 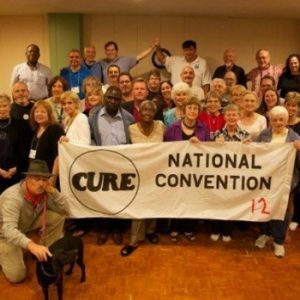 If you don’t go to http://nationinside.org/campaign/oklahoma-cure/ and sign up to receive it. KINGMAN, Ariz. (AP) - The departing head of Oklahoma's prison system has been hired for a top administrative post at a privately operated state prison in northwestern Arizona. Oklahoma Corrections Director Robert Patton announced Friday he is resigning and has accepted a position in Arizona to be closer to family. Patton didn't specify the Arizona job, but Boca Raton, Florida-based GEO Group said Monday that Patton will be deputy warden at Arizona's Kingman prison. By SAMANTHA VICENT World Staff Writer | Posted: Friday, December 4, 2015 4:01 pm Oklahoma DOC director Robert Patton Sept 2015 In this Sept. 30, 2015, file photo, Oklahoma Department of Corrections Director Robert Patton gives a statement to reporters in the media center at the Oklahoma State Penitentiary in McAlester. SUE OGROCKI/AP File Photo OKLAHOMA CITY – The director of the Oklahoma Department of Corrections will resign from his position effective Jan. 31, marking the second departure of a high-profile figure amid a pending investigation into a series of execution mix-ups in the state, a DOC spokesman announced Friday. Spokesman Alex Gerszewski said in a news release that Robert Patton has accepted another job in Arizona, where he worked before becoming the Oklahoma DOC director, to be closer to family. Patton will begin his accrued leave time on Christmas Day, Gerszewski said. Patton joins Oklahoma State Penitentiary Warden Anita Trammell, who announced her resignation Oct. 29, in leaving before the completion of an inquiry led by the Oklahoma Attorney General's Office into the DOC's handling of the Jan. 15 execution of Charles Warner and the events leading to Richard Glossip receiving a stay of execution via an executive order from Gov. Mary Fallin Sept. 30. Tulsa County says the Oklahoma Department of Corrections owes it $9 million, and is going to court to get it. County commissioners voted Monday to join the Sheriff’s Department and the Tulsa jail authority in legal action to recover additional reimbursement from the DOC for state prisoners held in the county jail. “Local taxpayers are subsidizing DOC,” County Commission Chairman John Smaligo said Monday following the board meeting. “The courts have ruled that we cannot use local tax dollars for state prisoners.” The jail authority is expected to act on the matter Friday. Tulsa County’s action is the result of a Bryan County lawsuit to force the state to pay at least the cost of housing state prisoners awaiting transport to state facilities. Lower courts ruled in Bryan County’s favor, and the Oklahoma Supreme Court refused to hear the case. This story is how change at the state capital starts. You must register to vote and get out there and vote if you want to make change. If you don't vote then you are part of the problem. The Oklahoma Board of Corrections on Thursday approved a fiscal year 2017 budget request that includes a $17 million allocation to handle a surge in the Oklahoma Department of Corrections’ inmate population. DOC Director of Communications Terri Watkins said during Thursday’s Board of Corrections meeting that the request to the Legislature for the 2017 fiscal year is “a budget that reflects our needs.” The DOC received about $485 million in appropriations for fiscal year 2016 and is asking for just under $505 million for the next year. The request for a bigger budget includes the $17 million for “offender growth” and $2.3 million for health services. Watkins said the DOC has faced an inmate population increase going into 2016 after a new law took effect this week requiring that counties submit to the prison system judgment and sentencing reports for inmates within three days of their sentencing. McALESTER – After a recent cadet graduation, the Jackie Brannon Correctional Center (JBCC) is at 100 percent staffing for correctional officers. According to Department of Corrections (DOC) recruiting records, the JBCC facility is the only fully staffed prison in the state. A recent spike in applicants for correctional officer positions has led to more academies and the DOC adding a special academy to accommodate the waiting list. The DOC is approximately 28 percent understaffed for correctional officers, a 12 percent decrease since July. NORMAN, Okla. – America’s incarceration rate has skyrocketed 700 percent since 1980, making the land of the free the second largest home per capita of the imprisoned. Those entombed behind bars have a lot in common, say the authors of the book, A Country Called Prison (Oxford University Press, 2015). Dr. John Carl and Dr. Mary Looman both teach at the University of Oklahoma. Dr. Carl is the assistant professor of criminology and criminal justice; Dr. Mary Loom is a psychologist and adjunct professor for the masters in criminal justice program. She works in private practice and for the Oklahoma Department of Corrections. They discussed the failings of the American prison system during a forum at the St. Thomas Moore Parrish in Norman where C-SPAN2 filmed the segment. It aired Saturday as part of the network’s BookTV series. OKLAHOMA CITY (AP) — The head of Oklahoma's prison system, whose tenure has been marred by problems with three scheduled lethal injections and now a grand jury inquiry into those complications, received a vote of confidence this week from the agency's governing board. Oklahoma Gov. Mary Fallin has been less forthcoming with a full-throated endorsement of Department of Corrections Director Robert Patton. After learning last month that Oklahoma's last execution in January was carried out using the wrong drug, Fallin said she wants to wait and see what's uncovered by Attorney General Scott Pruitt's investigation before publicly backing Patton. The position was reiterated Thursday by Fallin's spokesman, Alex Weintz, when asked whether the governor still had confidence in Patton's ability to run the agency effectively. State senators, a local representative and the McAlester mayor were set to tour Oklahoma State Penitentiary in McAlester today. District 7 state Sen. Senator Larry Boggs, R-Red Oak, said he anticipates touring the facility with Oklahoma Department of Corrections Director Robert Patton and six other state senators. Those senators are District 31 state Sen. Don Barrington, District 29 state Sen. John Ford, District 8 state Sen.Roger Thompson, District 4 state Sen. Mark Allen, District 18 state Sen. Kim David and District 26 state Sen. Darcy Jech, all Republicans. Also confirmed on the trip will be McAlester Mayor Steve Harrison and District 17 state Representative Dr. Brian Renegar, D-McAlester. Boggs said he expects about 30 people will take the tour in all. McALESTER — A man with Tulsa gang ties has been charged with conspiracy and kidnapping after reportedly forcing a woman to travel from Tulsa to McAlester to help him use a drone to smuggle contraband into Oklahoma’s highest security prison last month. Marquis Gilkey, 29, was also charged in Pittsburg County on Monday with attempting to bring contraband into a penal institution and committing a gang-related offense with Clifton “Chili” Wilson, an inmate at the Oklahoma State Penitentiary and purported general of the 107 Hoover Crips gang. Oklahoma Department of Corrections officials said staff at OSP in McAlester found a remote-controlled drone upside down on the prison grounds, with a package that had been suspended underneath by fishing line, at about 9 a.m. Oct. 26. GENESIS ONE POTLUCK, NOVEMBER 7th, at 7 PM -- YOU ARE INVITED TO THE GENESIS ONE POTLUCK FELLOWSHIP -- YOU AND YOUR GUESTS ARE INVITED TO JOIN US SATURDAY NIGHT, NOVEMBER7th, AT BETHANY CHRISTIAN CHURCH - 6730 S SHERIDAN RD. GENESIS ONE GRADUATES & CURRENT MEMBERS FROM AREA FACILITIES, AND FAMILY MEMBERS OF CURRENT MEMBERS, WILL BE IN ATTENDANCE. BRING SOMETHING GOOD TO EAT AND ENJOY THE GREAT FOOD AND FELLOWSHIP. CALL 918-665-3524 FOR MORE INFORMATION. GENESIS ONE POTLUCK, OCTOBER 3rd, at 7 PM -- YOU ARE INVITED TO THE GENESIS ONE POTLUCK FELLOWSHIP -- YOU AND YOUR GUESTS ARE INVITED TO JOIN US SATURDAY NIGHT, OCTOBER 3rd AT BETHANY CHRISTIAN CHURCH - 6730 S SHERIDAN RD. GENESIS ONE GRADUATES & CURRENT MEMBERS FROM AREA FACILITIES, AND FAMILY MEMBERS OF CURRENT MEMBERS, WILL BE IN ATTENDANCE. BRING SOMETHING GOOD TO EAT AND ENJOY THE GREAT FOOD AND FELLOWSHIP. CALL 918-665-3524 FOR MORE INFORMATION. When a person gets convicted of a crime, how much time should he or she spend in prison? When talking about Oklahoma’s criminal justice system, how do we define and measure success? To their credit, many Oklahoma policymakers are asking these questions. The public got a glimpse of the debate last week, when the Oklahoma Board of Corrections approved Gov. Mary Fallin’s recommendation to allow certain inmates to earn early release credits throughout their time in state prisons. On one hand, this is a minor change that brings state practice into line with state law. It might seem obvious that when punishing people for breaking the law, the state itself has a duty to follow the law. Nevertheless, a few legislators and prosecutors attacked the board and governor because the change will result in some prisoners serving slightly less time in prison. They are currently moving inmates around in housing. Those that have jobs will be housed together. Example OCI, kitchen and so on. They are starting to rotate allowing showers. The reason they didn’t have visits last week and why they are still locked down is that they had another incident when they were about to let them out 2 other gangs got into it. Min side had visits last weekend. It will be Friday before they know for sure if the Med will have visits this weekend. The Oklahoma Board of Corrections should be applauded, not pilloried, for making a common-sense and absolutely correct decision to follow the law and reduce the state prison population. The policy change, long overdue and recommended by the governor as well as independent justice reform evaluators, could save the agency at least $2.3 million over the next 18 months, incentivize inmates to follow rules and make prisons safer for corrections workers. The Oklahoma Pardon and Parole Board on Monday withdrew the new policy and said it will now move forward with the rule-making process to establish new eligibility parameters for commutation. The state Pardon and Parole Board acted improperly when it approved new eligibility requirements for inmates applying for a shorter sentence, the attorney general's office said. I spent the day at the Parole hearing. During the business meeting they advised they would have to undo their Commutation policies that they made last month. The reason being it must be done per the Administrative procedures act. This will take months. They will have to allow time for public input. The good thing is maybe we can get something for the lifers the bad thing is that all the victim groups could make it worse than it is now. So if you don’t want that get involve so you will know what is going on and when the time is for the public input. We stayed for after lunch for the victims/victims representative & the DA protest, it has been several years since I’ve stayed for some of that. They then started the jacket reviews. The last time the board members would talk about the case before voting. Today was heart crushing? They read the Docket number, said the inmate name and DOC #, then they start calling board members names and the response was the same no, no, no, no and no. for almost 200 names in about an hour, We left I had no idea they were that bad at this point I guess I shouldn’t have been surprised. If you want to change this then by all means get involved. If you don’t mind it then don’t. OKLAHOMA CITY Untreated substance abuse problems and mental health issues are among the reasons Oklahoma leads the nation in the imprisonment of women, state corrections officials said Wednesday. Oklahoma's female incarceration rate is 136 per 100,000 residents, while the national rate is 83 per 100,000 residents, according to figures released as part of a daylong legislative study on the issue at the state Capitol. As of Saturday, 3,211 women were serving prison sentences in Oklahoma, and most were nonviolent drug offenders who were imprisoned for the first time. "Could we have done something different than send them to prison?" said Mohsen Pourett, director of the Evaluation and Analysis Unit at the state Department of Corrections. OKLAHOMA CITY (AP) — The stabbing deaths of four inmates at a private prison in Cushing were the result of a turf war between two white prison gangs that also spilled over into other state prison facilities, the head of an Oklahoma prison workers group said Thursday. 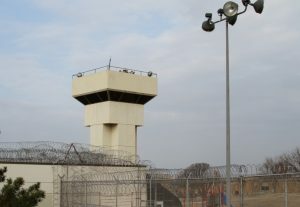 Sean Wallace, the executive director of the Oklahoma Corrections Professionals, said Saturday's attacks at the Cimarron Correctional Center that left four inmates dead and four others injured resulted from a feud between the Irish Mob and the Universal Aryan Brotherhood. "It's all about the Irish Mob trying to take over," Wallace told The Associated Press. Wallace said he didn't know which gang the victims belonged to. DOC just advised Cushing & Holdenville will not have visiting but everyone else should be so you still may want to call before you leave home. The Support Group for families and friends with incarcerated members. It's going to be on October 6th at 8pm at the Contact Church of Christ. 1529 W. 49th St Tulsa ok 74107. This is 1 block off of 51st and Union. Behind the QT and Warehouse Market. If you feel like I do, brokenhearted, sad or just want to share some experience,strength and hope please come join us. The group meeting will deceide how often they will meet once a week, every other week or once a month. (this includes min. yards) Terri Watkins, spokeswoman for the Oklahoma Corrections Department, confirmed on Tuesday the lockdown, which means inmates are confined to their cells 24 hours a day with all activities and visitations suspended. All Oklahoma prisons are on lockdown in the aftermath of a disturbance Saturday at a private prison in Cushing that left four inmates dead from stab wounds or sharp force injuries, officials said. Terri Watkins, spokeswoman for the state Corrections Department, confirmed on Tuesday the lockdown, which means inmates are confined to their cells 24 hours a day with all activities and visitations suspended.